If you have ever owned a Playstation, you will probably have heard of, and quite possibly even played, the game of the same name. It's a great game! Still, the movie of which it is based on is much better. Back in the 80s, the director Walter Hill was the biggest name in American action cinema, and with The Driver he was just starting to show his talents. Great action scenes will keep you on edge the entire film, but what makes this cult film really special is that there's almost no dialogue! The characters just stare at each other in scene after scene. And though this might sound boring, when you see how outstanding these actors are, you will be mesmerized by the electricity that's almost visible between them. You'll hope they wont speak. In this film, silence is shinier than gold. 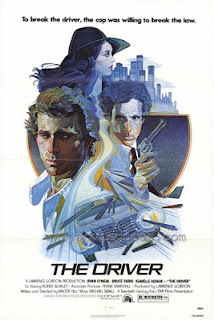 With modern action film actors not being able to do one tiny movement without uttering some sort of über-cool catchphrase, the lack of any such gimmickry makes The Driver a truly a unique experience.